I recently designed a corporate e-learning that was meant to inform employees about a cultural change within the organization. We’re implementing LEAN methodology and the audience spanned several business units, each with it’s own goals and processes. The business goals for the project were not specific or measureable and the training became a lot of information dump with multiple choice questions after each module. 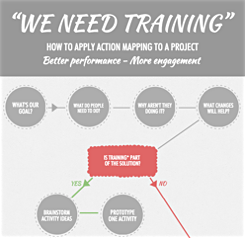 I saw this concept of Action Mapping after we had built the training and wish I could go back in time because when I see our final product, it could have been so much better. So I’m looking at how I could have rewritten one of the courses- just to see what it may have looked like if I had used Action Mapping. Do you have any advice on how to write specific and measureable business goals when you’re trying to inform people of a cultural shift and transition into using LEAN methodology? John, thanks for your question. Since lean methodology uses a lot of measuring, my first suggestion would be to ask the organization what changes they plan to measure (for example, what waste do they want to reduce, and by how much?). That would then help you identify lots of behaviors that need to change and continue the mapping from there. However, one of your big challenges is that the audience was so broad–if the material is supposed to apply equally well to units with different processes and internal goals, then it’s hard to set one measurable goal for the project. In a perfect world, you could divide the materials into one modules for each group, show them how lean methodology would improve their results, and create practice activities for the behaviors that need to change. 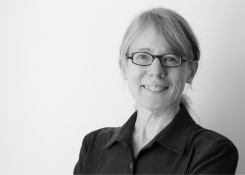 If the main goal behind the material was just to get employees to accept the change–basically to sell them on lean methodology–then you could measure how quickly the methodology is adopted, like “90% of business units will implement step 1 of our plan by Dec. 1.” However, it’s harder to come up with clear behaviors and activities for that sort of goal, however, because you’re looking for actions like “Willingly consider changing your workflow to incorporate lean method X,” which is hard to practice and to measure. The slideshare presentation is missing – is this temporary (hopefully)? It looks like Slideshare is having some trouble, but the presentation should load eventually. Thanks for your web site and your ideas, I found it so interesting and useful. I love your approach of instructional design. It looks simple and I found it very helpful for businesses. I am an instructional designer and I always thought that I was missing the goal by simply transposing content into e-learning. I always have spend a lot of time doing knowledge analyze, trying to identify Principles, Facts, Procedures and Concepts, and putting them in relation to each other. I think with your approach, this analyze will be least time consuming. Actually, I am wondering how import do you think it is to do knowledge mapping based on Principles, Facts, Procedures and Concepts. – When you’re trying to figure out why people aren’t doing what you need them to do (why the need for training exists). For example, do they understand the principles but don’t know the procedure? – When you’re brainstorming activities–for example, you can make sure your activities have learners practice applying concepts as well as facts. However, I think the principle/fact/procedure/concept analysis is only a small part of the larger analysis. It’s most useful when it helps you figure out how to help learners practice real-world behavior. It probably has its roots in the education world, which is more focused on getting information into people’s brains and not necessarily on changing specific behaviors. I’m an ex-technical writer moving into instructional design via an online certification program, and in our textbook we’ve just had to read about topic analysis that breaks things down into principles, facts, procedures, and concepts. So glad I stumbled across this post on action mapping and your concrete comments on the when topic analysis is actually useful. Makes a lot of sense to me and will probably save me quite a bit of time in designing the projects I’m currently working on. Thanks Cathy! 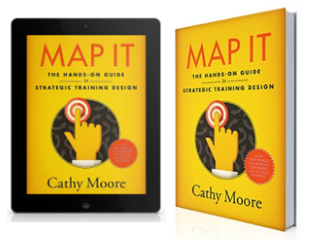 Cathy – I have been using this approach sporadically as we actually have a pre-fabricated e-learning production template/player that addresses the instructional design requirements for most of our courses (It does line up nicely with the action map approach however). As more SME than instructional designer, I find the action map to be well-classified and places boundaries that content people such as myself need to have (or risk the dreaded 24 hour course). An area of definition that I tend to get hung up on is related to the specificity of the action that helps achieve the business goal. As an example, a curriculum we are putting together for healthcare finance has identified a business goal as Achieving Budget Neutrality. One action we have is to “Identify variances on monthly expense reports” but another action is “Minimize the use of premium labor”. The first is very specific and the second is much more generic; almost holistic and likely has numerous other actions/activities underneath it. Any particular guidance around deining actions? Jason, thanks for your question. It helps to make sure that the actions are observable behaviors and not results or goals. “Identify variances on expense reports” is an action because it’s observable–there’s Bob, going through the expense reports, flagging variances. But “minimize the use of premium labor” sounds more like a goal than a discrete, observable action. So for that category, it could help to identify the observable actions that bring about the result of less premium labor. For example, an action might be something like, “Before choosing a premium provider, determine whether sources A, B, and C could provide the service.” That’s observable–there’s Martha, calling provider A to see if they can do what she needs so she doesn’t have to go with the premium guys. The *result* of her action could be that premium labor is used less, but the action is a discrete, observable behavior. This is my second visit to your site and it’s as if a light just went on. Thank you so much for the Action Mapping information. I definitely plan to introduce this concept Monday when I am back in the office. It seems so simple, but I think we often make things more difficult than they should be because of the way we were taught to learn (rather than the way that we actually do learn). Francis and Sarah, thanks for your comments. I’m glad the model will make your work easier. Cathy, thank you so much for this post (and your blog). I’m just taking my first steps into the e-learning arena (mostly reading, reading, reading), and trying to connect all the dots from various information sources on the subject I’ve been fortunate to find. I’m beginning to think about content for a Web project, and wasn’t really sure where to begin or how to structure it, or even what to focus on or what to include (or not include). 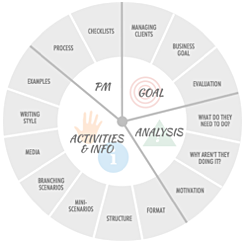 Your action mapping is on target with what I want to accomplish (for me and my user). I’ve used MindManager in the past, and have been actively using iThoughtsHD on my iPad to map out a detailed plan for my project. I LOVE mapping! Now, with your help, I’ve got a simple, ACTIONABLE framework to help guide strategy and assemble the pieces. I can’t thank you enough! Gracie, thanks for your feedback. I’m happy to hear that the system will work for you! Thanks for this very useful article. It helped me a lot to become clearer about what to do. What do you think? Am I just not able to see the measurable goals? Hi Steffen, thanks for your question. I agree that “soft skills” areas like cross-cultural communication can be hard to quantify. One place to start could be to identify the visible behaviors that show that someone is cross-culturally competent. What does that person do? How can you tell by watching and listening that they’ve had your training? How does their behavior affect the decisions of the people they interact with? From there, you could try to identify how their employer benefits. Does the culturally-competent person close more sales? Build long-lasting relationships, which increases customer retention? Communicate more effectively, which makes communications more efficient and less expensive? Avoid insulting people, thus reducing the expense of lawsuits? If you do custom training, you could ask the client to identify more concretely how they expect to benefit from the training. Ideally, they’ll be able to identify a measurement that they use now (such as income per customer) and they’ll believe that cross-cultural training will improve that measurement. For generic training, you might want to pick one common goal, such as increasing sales across cultures, and use that as your starting point. I hope this helps. Does anyone else have any ideas? If so, please add your comments. Thank you very much for your ideas. Very helpful hints. I have the feeling that some of the questions are hard to answer – even for our customers. And a whole bunch of scientific work has to be done – as there are still quite some questions which are unanswered. So, your answer opened quite a lot of potentials to enhance quality of cross cultural training. Thanks a lot.